Well last Saturday, I was with 300 Surrey Guides West and running a workshop on fundraising, and tomorrow I am with the Boys Brigade at 5.00pm running a regional quiz show, when I should be doing something else- the clue is in the title! Messy week really..that funny half – term feel, when I think I should be on leave too. Roads much easier though. 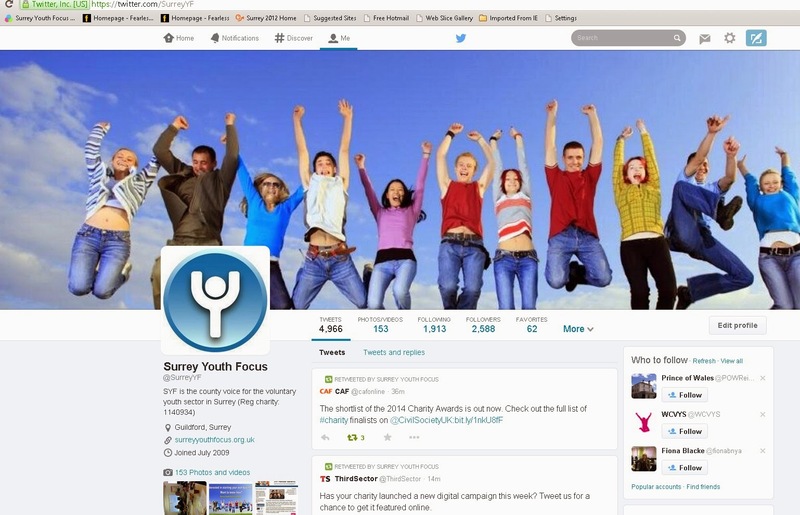 Getting to closing stage of commissioning a designer to do the complete revamp of the website, and have agreed that we will go public on our new brand in the next edition of Surrey Youth News out before Easter (ie end of March). We continue to grow the number of member offers and have now found a service that offers pro bono marketing support called “Pimpmycause” – see website. Important Management and Finance meeting when it was agreed to renew our Pqasso quality mark (expires Nov 2013) and do so at a higher standard – Level 2.Also agreed to recruit a business admin apprentice and replace our Youth Development Worker but in an amended role. Twickenham 5.00pm Saturday……on TV record! The sacrifices I make for SYF!! Well a great week and I get paid for doing what I enjoy! I had a great coaching session with one of my Trustees on Tuesday when I was given challenging but invaluable feedback. The way to learn and grow. Then I was at NCVYS in London in the afternoon hearing about how similar organisations are managing in the current climate – financial struggles but great opportunities. View was that local authorities were espousing out-sourcing commissioning/contracting but retaining/returning services in house. Central overhead costs of course increase as a % if services are outsourced or discontinued. The networks theme continued today with a discussion with a consultant whom we have engaged to consider the SYF future using “Big Assist” funding from NCVO? Lottery funding. Promises to be a ground breaking piece of work. Very interesting briefing about the “Transforming Youth Custody” published on Wednesday by the Ministry of Justice. . Gist is to create “secure colleges” for young offenders in which education and training is the main priority. There will be a lot of interest in this, especially as the current average cost is quoted as £100,000 per person pa.
Work on branding, new website, and the social enterprise is all progressing, and I had a very good discussion on Thursday with a colleague from RAISE working on an analysis of the dimensions/issues facing the voluntary sector in Surrey. And a whole lot more I can’t mention, so a really good week. Giving a presentation to Surrey Guides tomorrow (yes I know it’s a Saturday, but there are no rugby internationals - great win by England in Dublin by the way - Delighted Assistant England Manager). As it's Lent I have given up alcohol and hope that’s of some benefit apart from the financial. Bulbs are out in the garden…must mean Spring is coming! Slightly odd week as I took Monday off to walk on the Sussex Downs in preparation for my Y toY marathon charity walk next month. It was very cold and I was walking into a strong wind all morning, so only did 11 miles not the 19 I planned – quite pleased even so. Good news has been that we bid successfully to NCVO for “Big Assist” funds to enable us to retain a consultant with whom to work in developing a “big picture” about a network of interlinked organisations in the voluntary youth sector in Surrey. It is very evident that voluntary sector organisations either need to merge , as is happening all over the place, or use the talents and services within, and between organisations, and at the same time minimise and share support costs. SO we are using the consultant to begin this exploration of possibilities. Shelagh our volunteer Adviser has just had a very positive meeting with the Director of the Wearesurge.co.uk website and we will be putting all our Member vacancies/volunteering requests there. “The Eleven” company will also be supporting the Celebration of Youth in October. The CiC is progressing towards its start and the next step is to recruit the staff. Kate is working on the next set of workshops for young people about How To set up in self-employment/social enterprise. I was invited by the Leader of Surrey CC, David Hodge, to send our Communilab proposal to him and to David McNulty, and we wait to hear if it is an innovation they will support. Sad catalogue of errors and mismanagement at Stafford Hospital - the way we treat elderly people is a test of our culture, and we are found wanting at present. It is of course all to do with values…people…caring…grace (putting self in another’s shoes) and so on, rather than the I want/need/not paid to do/ not my job mindset etc . End of sermon. Delighted with England last Saturday….note my man Billy Twelvetrees had a brilliant debut and scored a try. Ireland away on Sunday(but Matiida’s 3 year old birthday party first on Saturday) . IF England win they will really have progressed. A very enjoyable week – what it feels like to me at present is that there are financial concerns, but offset by lots of innovative opportunities. I was at a Surrey CC Leader’s briefing for the voluntary sector on Tuesday. Surrey CC are setting a deficit budget making efficiency savings and drawing on balances to manage the gap back to a balanced budget. Where have I heard that before? I had a quick word with David Hodge , the Leader, and was asked to send him and David McNulty (Surrey CC’s CX) ) a one page brief on our Communilab proposal – a virtual network linking community charities- universities- local authorities and business. The brief went off today. I had a meeting early on Thursday morning with a corporate who were one of our original “4x4Project” members, and they too are interested in a number of opportunities to get alongside and hopefully sponsor some of our projects, including Communilab. Further good news is that we have been granted a £6,000 “voucher” under the Lottery’s Big Assist programme to spend on consultancy support so that we can do some strategic thinking about relationships and opportunities within the voluntary youth sector. We have evaluated the first of our Surrey Youth Enterprise workshops for disadvantaged young people about How To become self- employed, set up in business, and we have slotted dates for 2 more. Our own social enterprise is also moving on apace and we are hopefully closing on the leasing of premises on Tuesday for the business. We are making progress on commissioning a new website, but as funding is tight we need to “get it right first time” in terms of thinking through who is our target audience and what are the “topline buttons" of the services /information we wish to convey. This in turn links to our new branding. Good luck to Marie Silvester our youth development worker who after 3 years with us has moved onwards and upwards to another job in Berkshire. And finally, most gloriously, the Six Nations rugby starts on Saturday and England have picked “my man” Billy Twelvetrees (think Sevenoaks) who not only comes from Chichester, but was first spotted by me when at a Wasps v. Leicester match about 3 years ago, and I am on record (with my sons) as saying “ he’ll play for England”. Sat. 4.00pm. England v. Scotland.